As last year's Glastonbury Festival geared up, there was a strange and wonderful mood-setter going on in The Park's Stonebridge Bar. The Thursday afternoon bill included a DJ turn from Kevin Rowland, once of Dexys Midnight Runners, now of Dexys, but effectively the same singer, same band, whatever the years had done to the man and the personnel. The latest incarnation of the shape-shifting group had headlined the Acoustic Stage the year before with theatrical panache, still pushing triumphant 2012 comeback One Day I'm Going To Soar, but this time Rowland was taking us through other people's records. A soul-infused set hit some kind of euphoric peak when Rowland played Harold Melvin & The Bluenotes' 'The Love I Lost' then segued into an instrumental mix where he took the mic himself, opening up whole new vistas for karaoke. You don't get that with David Guetta; well, not with such ecstatic results anyway. What could have been preposterous ended up stupendous, because that's what Rowland's fervour does. He means everything so completely that the most unlikely – and occasionally ill-advised – idea comes off. 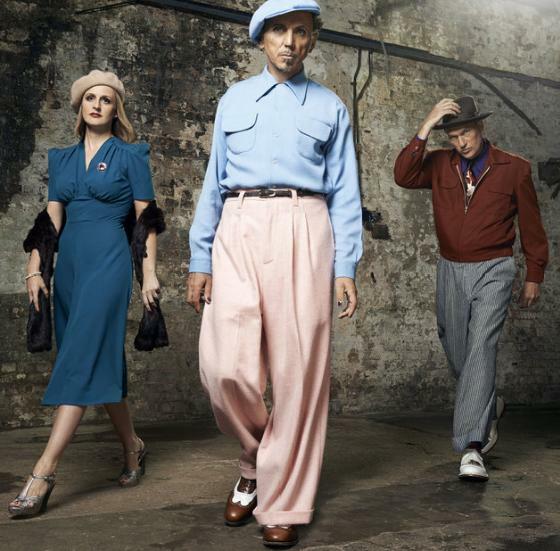 Rowland's at it again on Dexys' second/fifth album Let The Record Show: Dexys Do Irish And Country Soul, tackling classics and selling new schemes. This time he's squeezing it all into a concept, but what Jerome Kern's 'Smoke Gets In Your Eyes', the Bee Gees' 'To Love Somebody' and Joni Mitchell's 'Both Sides Now' have to do with the remit is anyone's guess. Let's assume he's covering songs he loves. LeAnn Rimes' 'How Do I Live?' goes some way to fulfilling the second half of the album's title, but it's a surprising choice, an adventure in schmaltz rescued by the 'core' band of Rowland, violinist Lucy Morgan and keyboard player Sean Read who, along with auxiliaries, grace the album with touch and commitment. 'How Do I Live?' is recast as Memphis soul, 'To Love Somebody' scales the heights when Rowland shouts "Timmy!" (an echo of "Jimmy!" on 1980's 'Burn It Down' and again on 1981's 'Plan B') before a lovely, fluid guitar solo, and a brisk, sunny version of The Friends Of Distinction's 'Grazing In The Grass' feels like southern-fried Allen Toussaint. It's a quarter of a box ticked at least. What's more striking though is the “Irish” slant of Let The Record Show, the latest step in Rowland's quest for identity. He was "searching" when we met him, then spent years sweeping through line-ups and styles, the Celtic Soul Brother No.1 trying to get a fix on his Irish roots. In the sleevenotes for the 1997 reissue of Dexys Midnight Runners' third album Don't Stand Me Down, Rowland bared his cold feet. 'Knowledge Of Beauty' was now titled 'My National Pride', and evidently that was what it was always meant to be. "It started off being called 'Dave' about the west of Ireland pronunciation of that word, and then for most of its life during the recording, it was called 'My National Pride'," he wrote. "That is its true title, I just didn't have the courage to title it that when it came around to the artwork, because I didn't believe in myself, and that I had the right to be Irish, I was kind of scared." This very album has its origins in a project simply named Irish, an exploration of Irish song that Rowland was planning in the mid-80s, around the time of Don't Stand Me Down's original release. The idea fizzled out – something Rowland blames on the break-up of the band, but it's surely not a stretch to assume a crisis of confidence did for it too. Now comfortable in his own skin (and natty threads), he's finally ready to give it the attention and belief it deserves. Traditional airs 'Women Of Ireland', 'Carrickfergus' and 'Curragh Of Kildare' are evocative, stately and impassioned, respectively and alternately, and Rowland's bolshy old yelp has softened to a croon. He brings the kind of authority he didn't always have 30 years ago, along with a hard-won wisdom that gives him the character to handle this stuff sincerely. Obviously he throws in the odd "HURGH!" every other song, but that's just projecting passion. Somehow it all converges on a rendition of 'You Wear It Well' by that other celtic soul brother, Rod Stewart. A bit of country, a bit of soul, a suggestion of old Ireland, all produced like a Traveling Wilburys record. In the warm sense, that is. It's a comfortable album altogether, delivered by a man and band sure of who they are, not exactly anti-fashion (or wearing flares), just secure in their own style. The sigh at the end of final track 'Carrickfergus' speaks of a journey that's reached a long-sought milestone, a sense of belonging. Rowland stakes his claim and he wears it well.